Take a ride with Danny Butler around the Punte del Monte Ranch in deep south Texas and you start to get an idea of his appreciation of all things wild. 09—We have a lot of white-tail, a lot of turkey, lots of quail. In my opinion, it’s better habitat now than it was 150 years ago. The Butlers are the 2015 Lone Star Land Steward Award recipients for the South Plains Ecoregion. Three generations of Danny’s family owns and operates the 23-thousand acre ranch; they and their ancestors have been at this a long time. 08—Going on 160 years, which is getting rarer and rarer in Texas that lands pass through generations and generations and stay together. Their H. Yturria Land & Cattle Company has become less reliant on cattle and more focused on wildlife, including hunting. To make the habitat work for wildlife, they improved water resources on their land. Randy Bazan is ranch foreman. 06—We’re roller chopping this pasture here. It makes an indentation in the soil, and that helps gather our rainfall. This improves the diversity of forbes and grasses, making the land more productive. While native wildlife hunts make up the bulk of the ranch income, the family’s expanded into exotics. Richard Butler. 08—If you don’t diversify, get other sources of income coming in from the property you’ve got, eventually you won’t have the property. Nominate a landowner for a Lone Star Land Steward Award. Find out how ion the Texas Parks and Wildlife website. Will Chronic Wasting Disease Affect Hunting? When news of Chronic Wasting Disease—or CWD—in a captive breeding population in Medina County surfaced in June 2015, TPW had a management strategy ready to go. 14—Once we got this positive, we began the implementation of that management strategy that we’ve had in place. We immediately restricted movement of all captive deer in Texas until we could do a risk assessment and determine the prevalence of this disease. Steve Lightfoot, Texas Parks and Wildlife spokesman, said careful monitoring of Texas white-tailed deer continues. Meantime, in case anyone’s been worried, hunters need not change their plans this fall. 36— We don’t foresee any changes in how hunters across the state of Texas conduct business this fall. We anticipate that it’s going to be excellent hunting conditions; we’ve got recent rainfall that’s pretty much turned the landscape around. Deer are in healthy shape. And so, right now this is an epidemiological investigation into one deer, in one breeder facility, in one country in Texas. So, I would encourage folks to go about the business of enjoying this wonderful heritage that we’ve got in Texas that’s deer hunting. There are 750-thousand deer hunters. Four million animals. It’s a great opportunity to get out there and enjoy it. Don’t let this deter it. Find CWD and fall hunting information on the Texas Parks and Wildlife website. The Wildlife and Sport Fish Restoration Program supports our series, and funds more than 40 million dollars in conservation efforts in Texas annually through your purchases of hunting and fishing equipment, and motorboat fuels. In June, volunteer monitoring at a captive deer breeding facility revealed an animal with Chronic Wasting Disease—or CWD. This put a halt to movement of captive animals statewide. 19— We permit the ability for folks to hold in captivity deer, for the purpose of breeding, genetic improvement, improving the quality of their deer herd. They can release the animals onto their ranches, or they can sell and trade to other facilities that are approved for releases. And part of that can be for hunting. Steve Lightfoot, spokesperson for Texas parks and Wildlife, says under a plan finalized in August, Texas deer breeders may resume animal movement. 17— With input from stakeholders around the state, leading epidemiologists, veterinarians, deer breeders and other stakeholders, have come to the table, and expressed their issues and concerns. We factored those into the development of this plan, and I think the movement qualification standards we developed pretty much meets those needs. The plan balances the need to minimize the risk of unwittingly allowing movement of CWD-positive deer while adopting reasonable movement qualification standards that allow qualified deer breeders to move and liberate captive deer. 15— We’re also looking at developing individual herd plans for those captive breeders to ensure that they can continue business with minimal risk of the disease impacting [additional animals]. And also, we’ll be looking at strategic sampling of hunter harvested deer once the seasons start this fall. 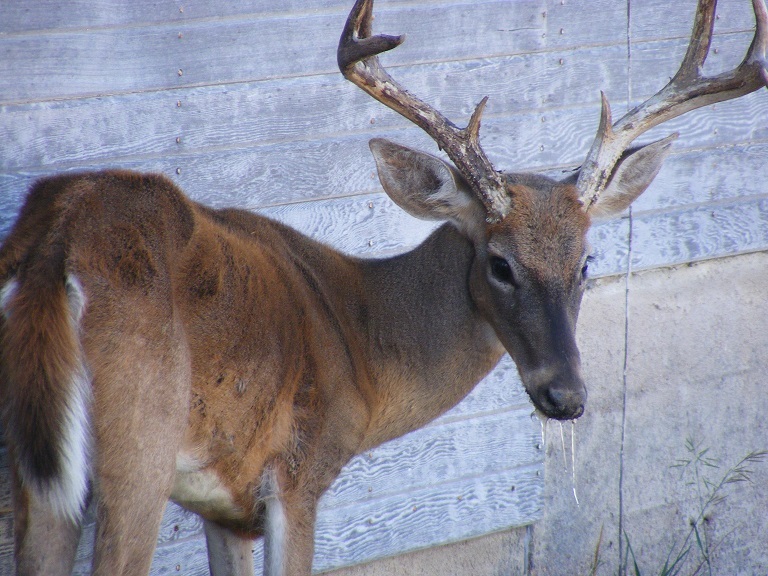 Find more information about Chronic Wasting Disease on the Texas Parks and Wildlife website. For most of us, the word “guzzler” has a negative connotation, but not for the groups working to restore bighorn sheep. 04— A guzzler is essentially a rainwater collection system for wildlife. Mark Garrett is Texas Parks and Wildlife Project Leader for Trans-Pecos Wildlife Management Areas. 09— We’ve got two large panels of sheet metal that collect the rainwater, funnel that down into storage tanks that feed to wildlife friendly watering stations. Adequate fresh water is essential for the restoration of big horn sheep. During a segment on next week’s Texas Parks and Wildlife PBS Television Series, see how volunteers from the Big Horn Society, Like Kathy Boone, install new guzzlers on the Black Gap Wildlife Management Area. 13— Work projects normally last a couple of days, and they are always in extremely remote areas. For this work project, we’ve had over a hundred people here to help us build two water catchment devices we call guzzlers. Workers must travel by helicopter to the mountain tops to construct the guzzlers, but volunteer Charlie Barnes says the challenges that come with the work are worth it. 11— This land is suitable for all the game that live here. It was missing one thing. Water. And now it’ll have water. That’s conservation right there. View the segment on Good Guzzlers next week on the Texas Parks and Wildlife PBS TV series. Check your local listings. 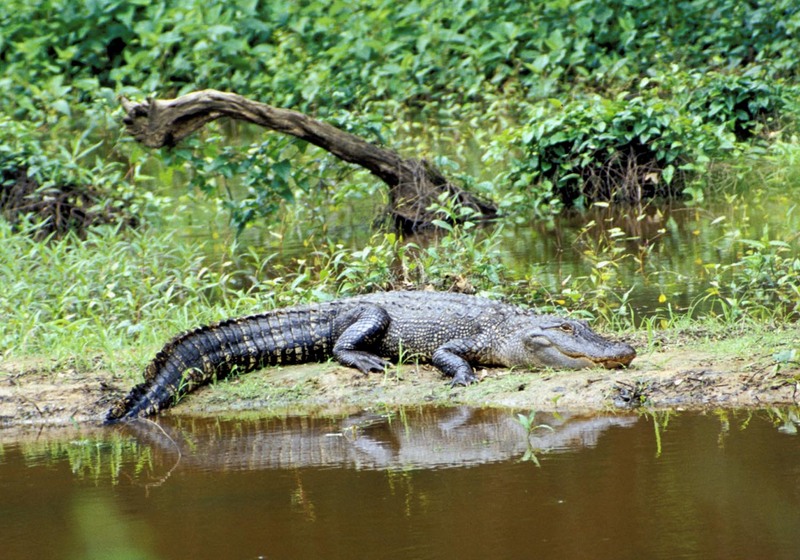 The American alligator is native to Texas and found primarily in the Eastern third of the state. According to Steve Lightfoot, 2015’s been an unusual year for this species. 11— More so because the timing of the flooding events that we had in May—right at the time when alligators are out. They’re doing their nesting and breeding. And so they’re active that time of year. Lightfoot is TPW spokesperson. He says the flush of fresh water into Texas’ river systems caused alligators to pop up in unexpected places. 31—The number of calls we get at the department saying ‘We’ve got an alligator here; what do I need to do?’ Those obviously have gone off the charts. We recently had some video tape that showed an alligator in the surf along one of our popular beaches along the coast. And people were really concerned. ‘Oh my gosh! What if my kids had gone out there?’ Well, guess what. That alligator was doing what that alligator does. He was out there because the fresh water came down. Salinity levels were low. It was an opportunity for him to get out in the salt water and wash the parasites off his hide. That’s all he was doing. And he left after he got through with that. And in places where alligators are a common sight: do not feed them, do not swim in waters where they they’re known to spend time, and if you leave alligators alone, they will leave you alone. You are currently browsing the Passport to Texas weblog archives for September, 2015.